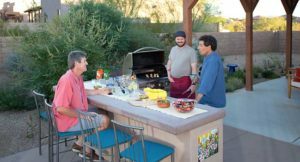 How To Choose A Landscaper | Sonoran Gardens, Inc.
At Sonoran Gardens we feel that you should have answers to these questions before you choose the company that will design & build your outside living spaces. How long have they been working in the landscape industry and what is their area of expertise? A good indication of quality workmanship is if their customers are happy. Are they open to you calling past customers for a reference? Check these sources for detailed information: online reviews, the Better Business Bureau and the Arizona Registrar of Contractors to see if they are current licensed, bonded and insured (www.azroc.gov/forms/contractorsearch.html). You can also do a Google search of the owner and check on his or her background. Listen to the way they communicate with you. Do they ask you questions about how you would like to use your outdoor spaces and what you really desire, or are they trying to push you into something that is quick and easy for their schedule and profit? 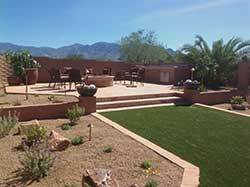 Does the company have extensive knowledge of all aspects of landscaping: landscape design, constructing hardscapes (patios, walls, ramadas, water features, etc. ), knowledge of plants, trees, cactus, shrubs and how to properly place and plant each one, Xeriscape, proper planting and use of pots, irrigation, lighting, etc. At Sonoran Gardens we are experts in all of these areas. Will they be providing you with a written plan and estimate? This should be expected. No one likes surprises. How long do they expect the job to take? In most cases, quality landscape design and construction is a big job. You don’t need a team of unreliable landscapers dragging the process out any longer than it needs to be. Is the job going to be finished on time or will there be delays? When do they expect payments from you? If they demand major payments up-front, think twice about hiring them. Companies asking for big payments early in the process tend to leave you hanging as they already have your money. At Sonoran Gardens we are extremely up front about our payment schedule. Typically, we ask for the amount necessary for the materials to complete your job. What types of warranties do they provide on each element of the construction? This includes plants, trees, lighting, hardscapes, irrigation, everything! Do they provide complimentary post-construction check-ups to make sure that everything is working and growing properly? This is a pretty comprehensive list of good questions that will help you to see if company is right for you. At Sonoran Gardens we are always open to any questions you will have. We never have anything to hide and we are proud of our reputation in our community!